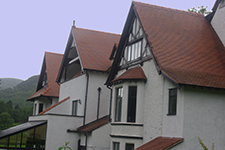 Jones Roofing since its formation in 1993 has provided quality workmanship and products throughout North Wales, Wirral, North West of England and Shropshire from our Head office in Colwyn Bay and regional office in Wrexham. Our director Neil Jones has over 37 years experience and together with Andrew Evans our Wrexham general manager (27 years experience) can offer knowledgable advice on all roofing issues. We offer free no obligation estimates and advice. We are pleased to have numerous satisfied customers from large national housebuilders, developers, local authorities and private homeowners. In addition with holding accounts with all the major suppliers we are able to purchase products at extremely keen prices which ensures competitive quotations which coupled with our high standards of workmanship ensures a quality finish at an affordable cost.